Capacities from 420 to 8400 pounds. Average Hardness - 60 Shore D on PD wheels all others 95 Shore A. Floor Protection - Affords a non-marking floor protective tread. Wear - Greater service life and resistance to chunking, cutting and abrasive wear. 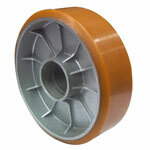 Capacity - Polyurethane tread material affords the carrying capacity of comparable.metal wheels.